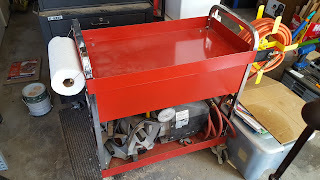 I have an inexpensive tool cart, which has my air tools in a drawer. 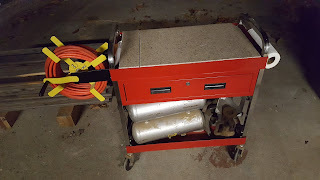 I modified it to fit my small air compressor underneath and a hose reel on the side. In the tray on top, I was collecting a lot of miscellaneous junk. 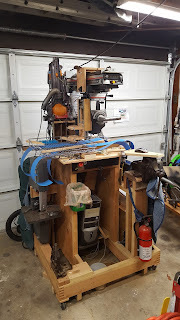 I have wanted a hard flat surface to align and measure things. 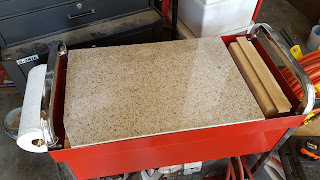 I had some leftover granite countertop, so I cut it to fit in the tray. I built it up underneath with wood and leveled it (more or less) with shims so the granite top is slightly above the rim of the tray. Let's see how it goes, and I'll post an update. So far I like that it's easy to clean off when I'm done working on something messy and it's not so tempting to collect junk on it. It's been working great for the last 2.5 years, but I was wrong about one thing: it is still tempting to collect junk on it! I cut an extra piece of granite to fill in the end where my first piece was short. It is handy to roll the cart out in the driveway when I need my air tools to work on the car (since my garage is full of woodshop and "future projects". All I need to do is pull out my extension cord to reach it.